The relationship between police and the citizens they are to “protect and serve” is dynamic and critical to a community’s social stability. 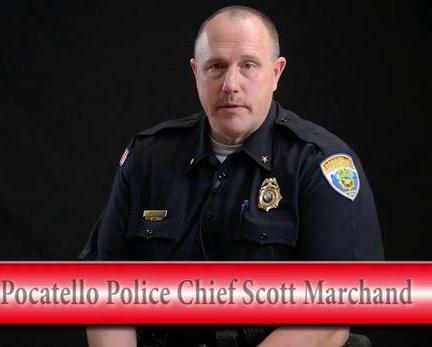 This partnership has shown signs of strain around the country with high profile incidents that Pocatello has thus far evaded. And that’s not by accident. We are fortunate to have responsive local law enforcement leadership that recognizes how critical this relationship is and the crucial role effective communication plays in maintaining this positive, cooperative relationship between law enforcement and the public. Every now and then anomalous incidents remind us how fragile this relationship can be. Wednesday evening a couple of sisters, attractive women in their 50’s, and their mother who is in her 70’s, were walking the track around the fence of Syringa Elementary. It was just past dusk, and after completing their fifth lap, had stopped by the side of the school under the lights to visit before they headed home. Whilst visiting, the girls’ father drove the short distance to the school in his pickup to check on them and make sure they were okay. He pulled into the parking lot at Syringa, and saw where his wife and daughters were under a light next to the school, and walked over to them to make sure everything was all right. Within just a couple of minutes, a Pocatello police car pulled into the parking lot with no lights on. Within moments, two more police cars arrived, also with their lights off. A couple of the officers came over to see what nefarious deeds the middle-aged walkers were up to. The lead officer was female, who seemed as if she had something to prove, either to the citizens she was about to harass, or to the other officers who arrived at the walking crime scene. Without even asking what they were doing there, she proceeded to get the names, addresses, and phone numbers of all four individuals. One of the sisters asked why the officer needed that information, and the officer offered no explanation. If she had said that someone had called in “suspicious” activity at the school, or that something had happened there in the past, it would have made sense. However, minus any explanation whatsoever, the citizens felt guilty for even being on the grounds that they had helped fund over the years. What followed truly shocked them. The female officer then asked each of them how tall they were, what their weight was, what color their eyes were, and what color their hair was. The officer then requested to see the tread of their shoes. Perhaps she was going to see if they’d been wearing out the track by walking more than their fair share of laps. All of this information was written down by the investigating officer to undoubtedly add to the city’s database of criminal joggers and walkers! Meantime, the backup officers were standing by; presumably to ensure none of these middle-aged slow-motion joggers sprinted away from the scene of their unmentioned crime. One sat in his car, the other, a K-9 officer, stood behind the female officer, undoubtedly ready to tackle anyone who made a dash for it, or to arrest any of the perps for saying the wrong hair color. Throughout the exchange, the female officer never made eye contact with her suspects. She grilled them for answers to her questions, without providing any justification for the information. The citizens, totally nonthreatening, and who would have appeared as suspicious as parishioners in a church, were left feeling guilty for the heinous crime of walking the school track and that their privacy was been violated for their infraction. They were left feeling more like subjects and suspects, than partners with the police. 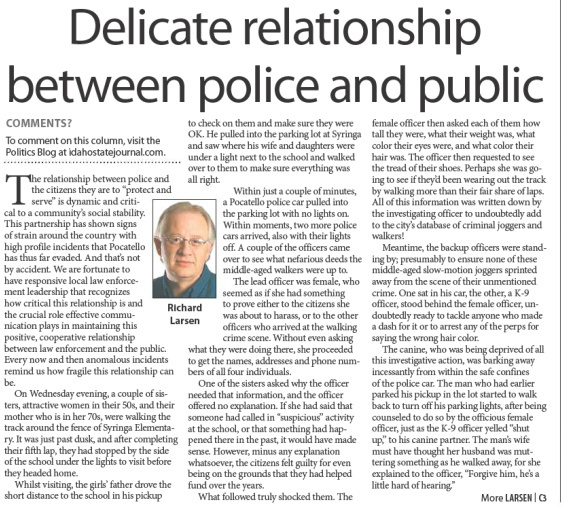 This experience could have turned out beneficially for all involved, if the officer would have answered the citizen’s questions, maintained eye contact, and talked with them rather than at them. They likely wouldn’t have objected to disclosure of the personal information if they understood the rationale behind their field interviews in solving past or future crimes in the area. 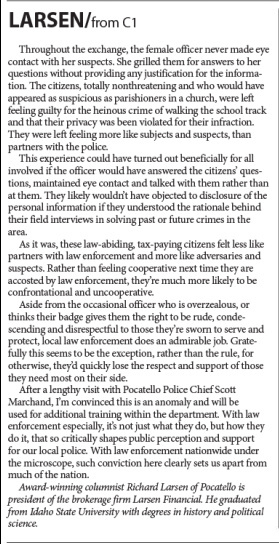 As it was, these law-abiding, tax-paying citizens felt less like partners with law enforcement, and more like adversaries and suspects. Rather than feeling cooperative next time they are accosted by law enforcement, they’re much more likely to be confrontational and uncooperative. 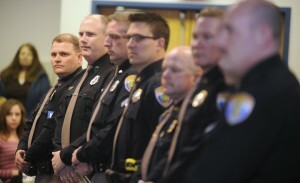 Aside from the occasional officer who is over zealous, or thinks their badge gives them the right to be rude, condescending, and disrespectful to those they’re sworn to serve and protect, local law enforcement does an admirable job. Gratefully this incident seems to be the exception, rather than the rule, for otherwise, they’d quickly lose the respect and support of those they need most on their side. After a lengthy visit with Police Chief Scott Marchand, I’m convinced this is an anomaly, and will be used for additional training within the department. With law enforcement especially, it’s not just what they do, but how they do it, that so critically shapes public perception and support for our local police. With law enforcement nationwide under the microscope, such conviction here clearly sets us apart from much of the nation.